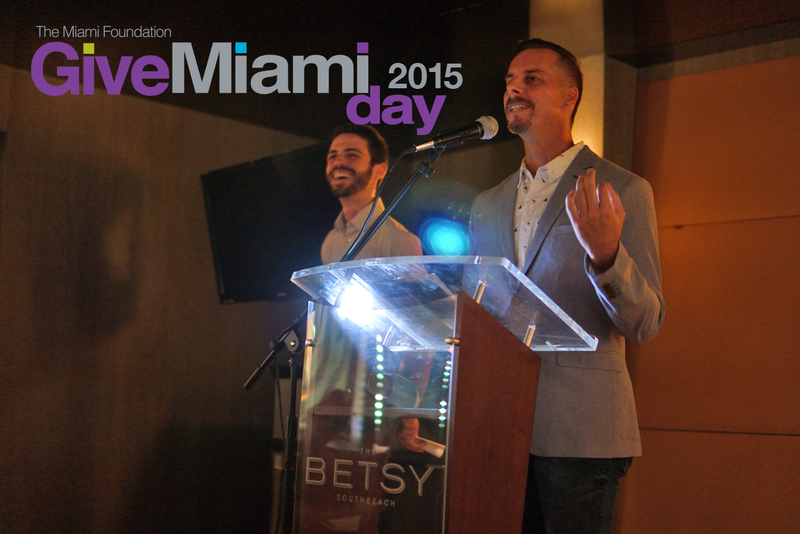 Jose Portela (RQ Program Director) & Neil de la Flor (RQ Executive Director) inaugurate the 2014 Reading Queer Literary Festival @ The Betsy Hotel – South Beach. Just over one year ago, I launched the first Reading Queer Literary Festival at the Betsy Hotel – South Beach. With the support of our sponsors and individual donors like you, Reading Queer inaugurated the first queer-centric literary festival of its kind in South Florida, featuring L. Lamar Wilson, Julie Marie Wade, Jan Becker and several locally and nationally recognized queer writers and artists. For the 3rd year, Reading Queer will participate in Give Miami Day, the most important 24-hour fundraising event of the year. This year, the giving begins at midnight on November 19th and ends at midnight on November 20, 2015 and I need your help to make giving to Reading Queer go viral! This is what I need you to do: donate, talk us up & share. Once you’ve made a donation, share our giving portal www.readingqueer.org/donate with your friends & family throughout the day & ask them to contribute on Give Miami Day, 11.19.2015. When you donate, talk us up & share our giving portal (this page) on 11.19.2015, you will have a measurable and lasting impact on the vitality of queer literary culture in South Florida by providing us with the resources to program the Reading Queer Literary Festival and The Reading Queer Writing Academy, a series of writing workshops aimed at fostering the careers of South Florida based queer writers. The 24-hour giving event begins midnight 11.19.2015 and ends midnight 11.20.2015 & the giving portal will be activated on www.readingqueer.org/donate at midnight 11.19.2015. Thank you for your time & please support us 11.19.2015 and beyond. With your support, Reading Queer will go viral! P.S. Please share our giving page with your friends, family and co-workers on your social media networks. WHAT IS GIVE MIAMI DAY? Give Miami Day is the biggest annual giving event in South Florida. This year, we will again ignite Greater Miami for 24 hours on November 19th. We made history on Give Miami Day 2014, raising $5.2 million for 520 local nonprofits from more than 19,000 donors spanning the city, nation and globe. WHY IS RQ VITAL FOR THE COMMUNITY? “Literature saves lives. As queer writers and readers we know this from personal experience. By inviting us to expand our sense of self to include the experiences of others, reading also lays the foundation for the building of strong and lasting communities, queer and otherwise, based on mutual care, respect and understanding. Writing, on the other hand, invites us to explore and create new possibilities for being and becoming in the world. The blank page can be a promise of new beginnings in a world eager to foreclose them, an invitation to take charge where we feel most powerless.” –José Portela, Reading Queer Program Director. HOW YOU CAN IMPACT CULTURE FOR THE GREATER GOOD: Make your tax-deductible gift in any amount through our fiscal sponsor The Miami Foundation. Your tax-deductible donation empowers Reading Queer to foster & promote queer literary culture in South Florida through the Reading Queer Writing Academy, The Reading Queer Literary Festival and the RQ – O Cinema Film & Literary Salon Series. Browse our archive and see what Reading Queer has accomplished to date.